The Exhibition continues until Saturday 22nd November 2014. When I first met the artist Lucy Pratt about 16 years ago she was already a success story. For this “Girl Wonder” with much aplomb, had conquered the Cotswold art scene exhibiting with the John Davies Gallery and most notably was having regular sell out solo exhibitions with the Ainscough Gallery in London. I was still Girl Friday here at the Fosse just in the middle of my apprenticeship so to speak, but Lucy, never one to stand still, had seized every opportunity and was well up and running. Through travel in the early days to India, Nepal and Thailand she sought her inspiration, but it was only on her return to the UK that I feel Pratt really began to define and hone her subject with distinctive, painterly style. Devon, Cornwall and Cadgwith in particular, places and communities so embedded in her from time well spent as a child through to adulthood poured out and her enduring motifs we have come to recognise and love, were realised. Lucy’s world on canvas is uncomplicated and we gaze through a Technicolor lens. The sun is shining, there is laughter, we take pleasure in the moment and feel the artist’s gregarious and positive nature emanate; for she is beautiful through and through. But don’t be fooled Pratt is not seducing us either, taking us down the garden path of fluffy confection. Her message is defined and packs a punch, one we need to keep reminding ourselves of especially in today’s world… how lucky we are and isn’t it good to be alive? 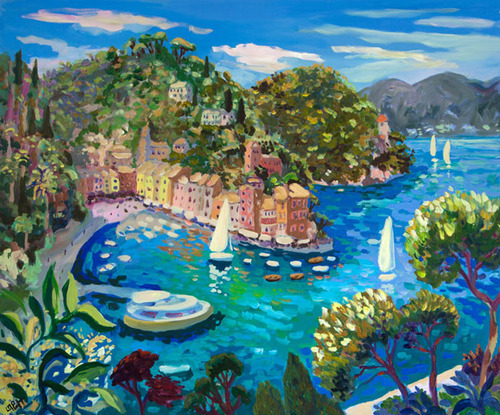 ‘Fun on the Rivieras’ is time well spent in the glamorous Portofino on the Italian Riviera and time well spent this summer on the equally glamorous English Riviera. These paintings express all that we enjoy and love about Lucy’s paintings. ‘This fourth one man show at the Fosse Gallery was already firmly formulated in my mind from the outset. I wanted to indulge in the pure delight of being outdoors and the gratification it brings. There is very little that I find as satisfying as being out with my bag of paints and a canvas on the hunt for subjects matter. The places I have chosen are firm favourites and with the repetition of revisiting them only continues to reaffirm my fascination and wonder in somewhere so beautiful. I would be quite content to go back day after day and be challenged a fresh to put down something of what is so stimulating to me’ Lucy adds. With singular determination and incredible energy, often painting well into the night especially when Tom and Zuzu were small, Lucy like so many formidable women artists before her and also of this generation has succeeded to combine motherhood with a flourishing career. Her paintings are in private collections all over the world. She has been selected and hung in the RA Summer Exhibition many times and is now represented in Mayfair as well as Stow on the Wold – proof enough that her particular and joyous vision of life will endure. The Fosse brought us together all those years ago and now I can say that we have both realised the dream!